May place order in person or by phone; no online ordering through Eat24. No delivery through DoorDash. Click on main image for video! Exceptional Mediterranean Cuisine including Kabobs, Shawerma, Salmon, Shrimp, Falafel, Salads, Pitas, Rotisserie Chicken, Hummus, Tzatziki, Vegetarian options, and so much more! Valid for eat-in or take-out! 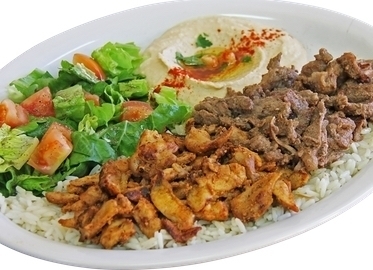 Mediterranean Pita Grill in Westlake and Calabasas is back by POPULAR DEMAND! And we skewered an exceptional deal at this 4.5 star-rated local grill: just $20 for two entrees, two drinks, and two appetizers or $40 for four entrees, four drinks, and and four appetizers! Each Conejo Deals member may purchase three certificates for personal use and three additional to give as a gift! I’m obsessed with the Chicken Shawerma plate and the Falafel plate and Rob orders the Beef and Chicken Kabob Combo plate. When we want just a quick bite, we get an order of Dolma (stuffed grape leaves), or vegetarian cheese rolls or tzatziki to go. Check out their menu online to find your personal Mediterranean favs! P.S. To stay current on what is going on at Mediterranean Pita Grill, join their legions of fans and follow them on Facebook!